I’m hearing Boston accents and fresh seafood is on the menu. 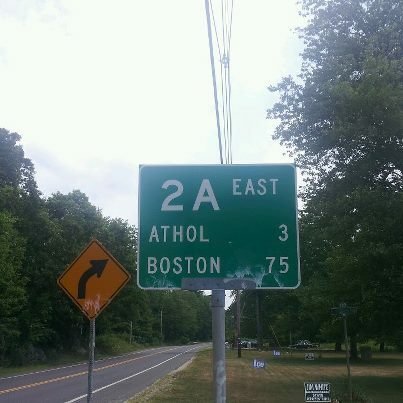 Earlier today, I saw my first sign for Boston. It said 75 miles. It made me a little giddy for a bit while I pushed on to my motel where I am enjoying an amazing meal at the adjoining restaurant. The clam chowder is good. I just mapped ‘it’. I could run it tomorrow. I might finish late in the evening but 67 miles to the water is theoretically runnable in a long day. I’ve run farther before. And tomorrow’s highs will ‘only’ reach 80 which will feel positively arctic after the last few days in the 90’s. But I’ve talked this through with my sister and also Glenn Caffery who ran across last year, and I think I would rather take it slow and easy and have a nice final run to the beach on Saturday. That said, I do reserve the right to suddenly run like a maniac to the water but I think it is pretty unlikely. 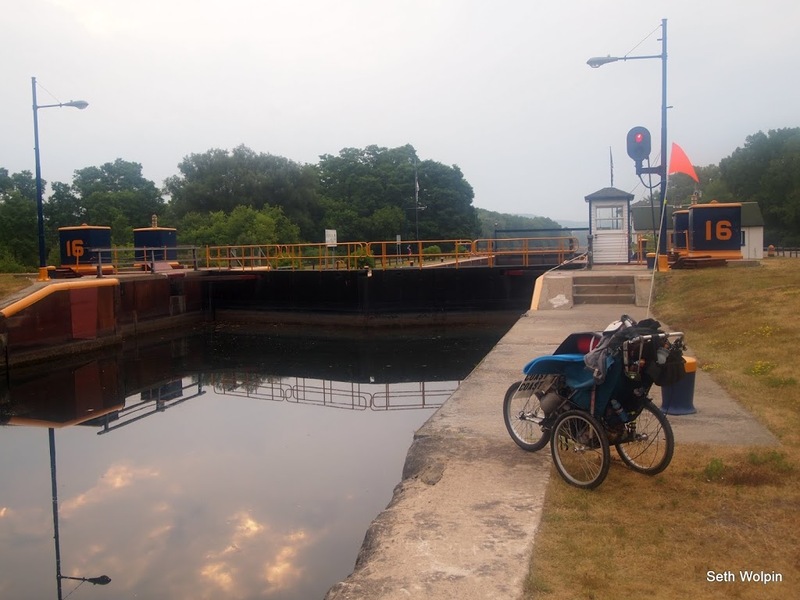 After my last post on 7/13, day 100 in Little Falls, NY – I hit the road around 4am and landed pretty quickly on the Erie Canal trail alongside the Mohawk River. 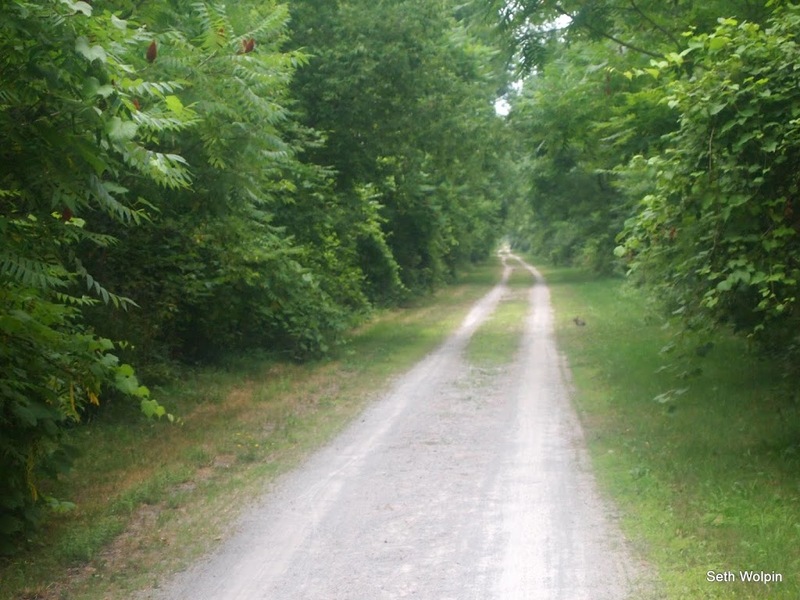 It was picture perfect with hard packed gravel and not a soul in sight, but unfortunately the deer flies drove me crazy. There were still some ‘feel good’ signs left from the cycling event the day before (the Buffalo to Albany riders I had met). The signs were a little bit of a tease. 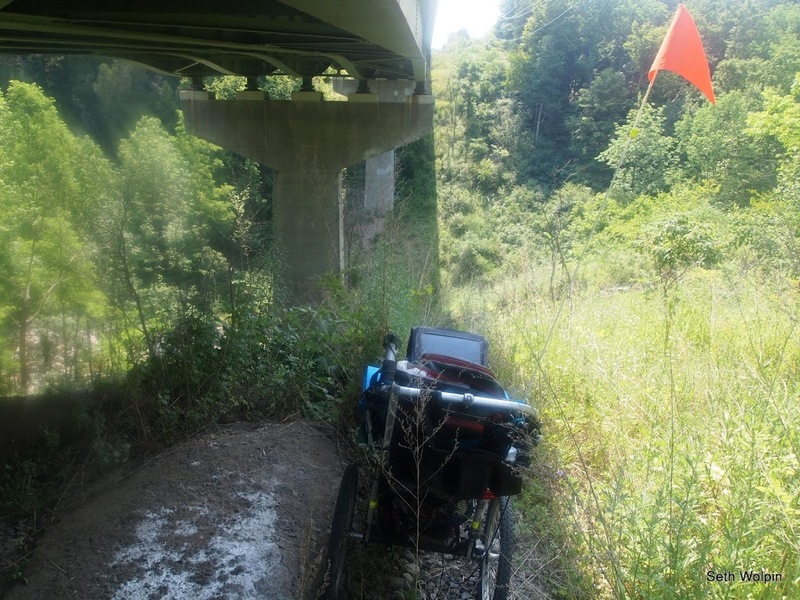 When it was finally time for me to rejoin the paved world with cars and all that, the connecting road and on-ramp that google told me to take simply did not exist, my goal was 80 feet above my head instead. Jennifer Elliot was one of my best friends from when I went to school in Saranac Lake, NY. We’ve kept in touch over the years and she deserves a huge amount of credit with inspiring me to sign up for my first marathon in 2006. Our main form of exercise in Saranac Lake was playing hacky sack with a beer in one hand. As we went our own way to other schools and lives, Jennifer started running and I pretty much didn’t. Learning that she was doing marathons back in ~2005 inspired me and I started setting some goals. Years later, how nice to find our paths cross with running at the center! 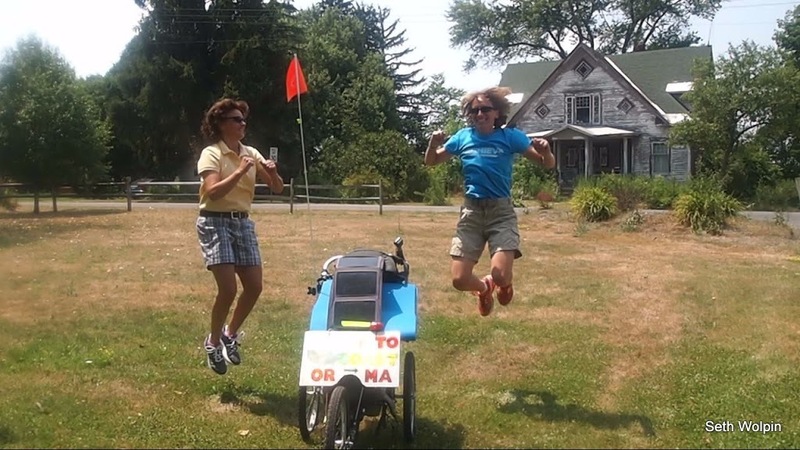 En route to the Musselman Half-Iron triathlon in Geneva Lake, NY, Jennifer and Diane found me at a rural cross-roads straight out of Deliverance and loaded me up with food and cold beverages. We said goodbye but I knew I would see them again. Jennifer demonstrates ‘the jump’ to Diane. A few hours later and I was positively baking with 39 miles on the odometer. Jennifer’s sister Andree lived nearby with her husband Dave and daughter Cara. It had been way too long since I had seen any of them and the heat was baking me. 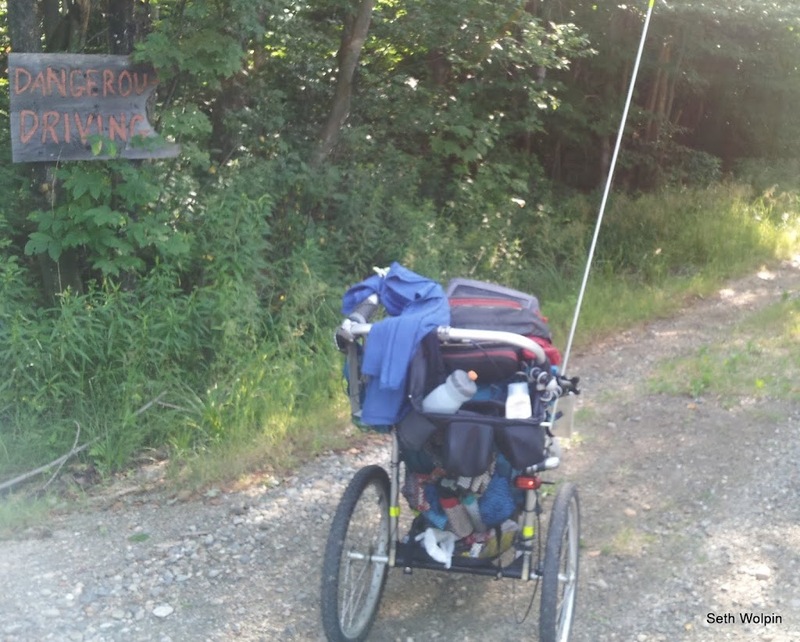 They rescued me at another crossroads near Charleston State Forest, not a great place for camping in the heat. Instead I drank beers in their front yard along with fresh corn on the cob and tofu dogs. 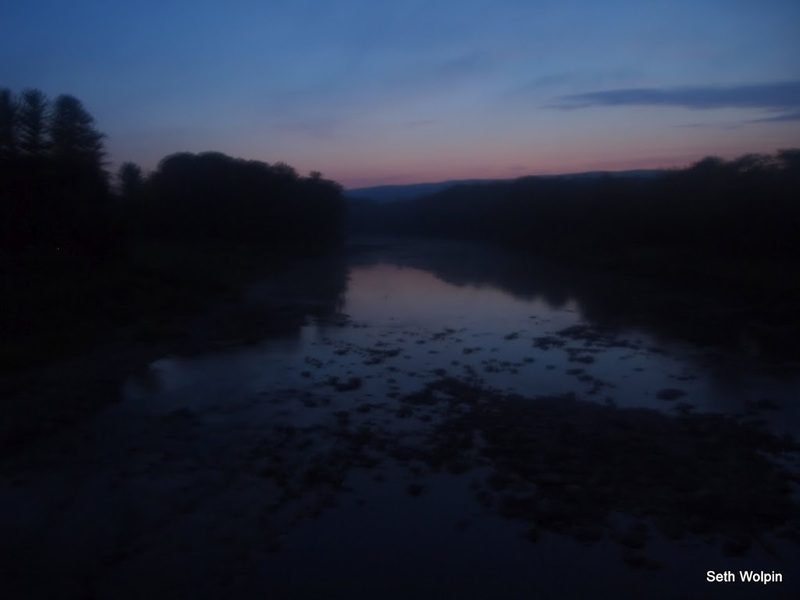 I was also happy that my remaining days were all around 30 miles long – marking this day as my last ‘tough’ day. Little did I know. 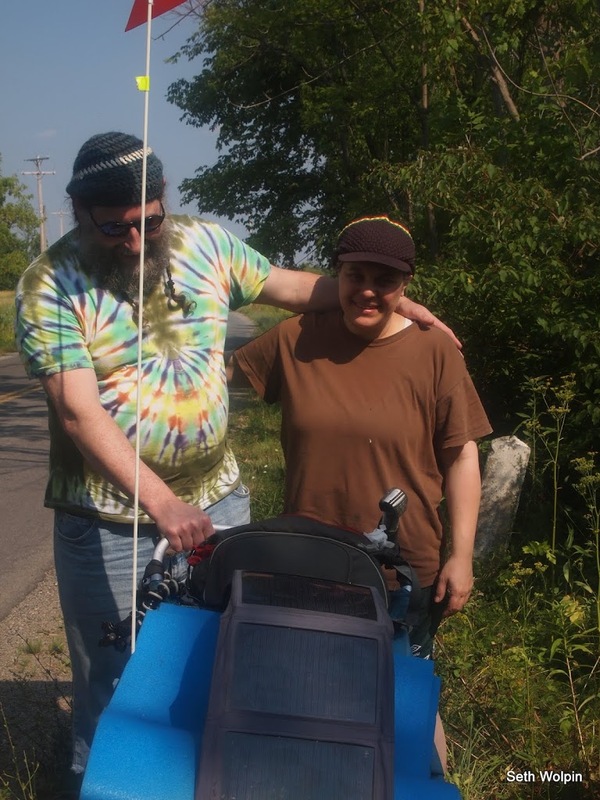 7/15 Dave drove me back to the cross roads at 4 the next morning after making sure I had everything I needed (thanks!) 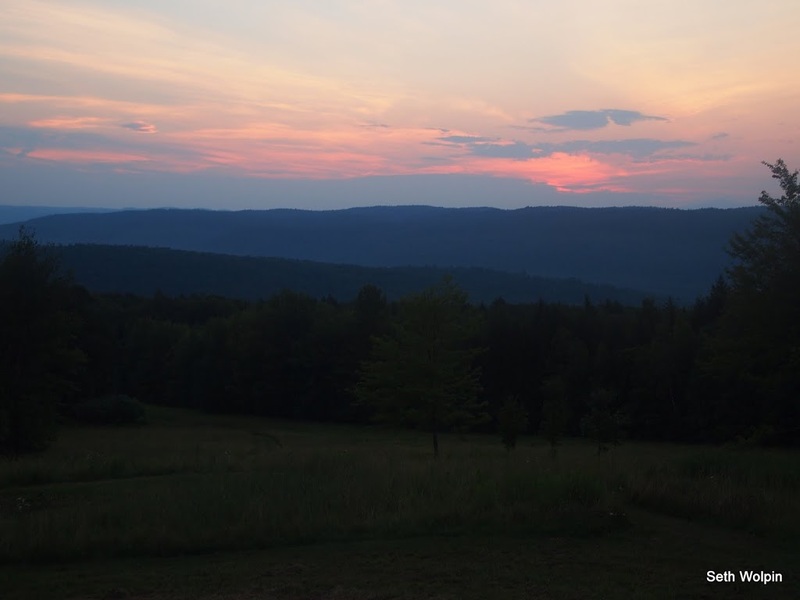 and I took off again heading for Albany – crazy downward hills and stars in the sky. 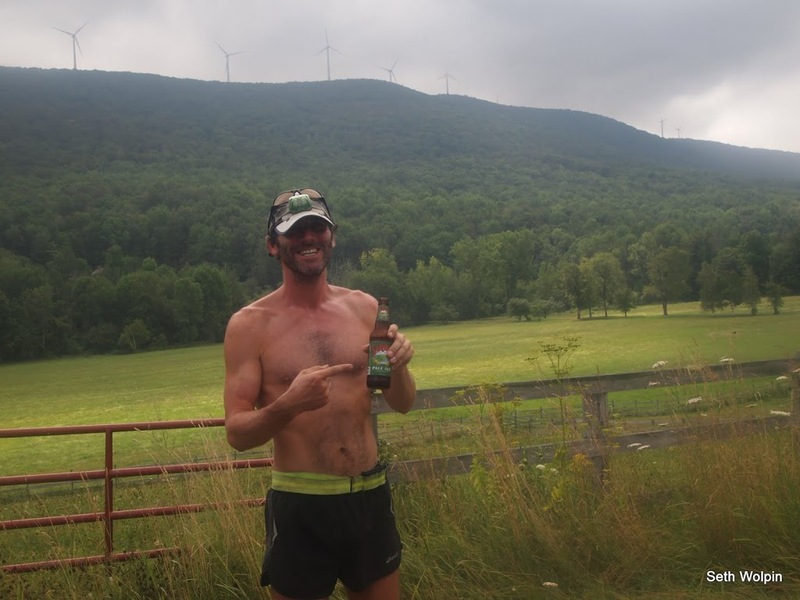 Ben Jacobson, a family friend from Northern NY, found me about 7 miles later. 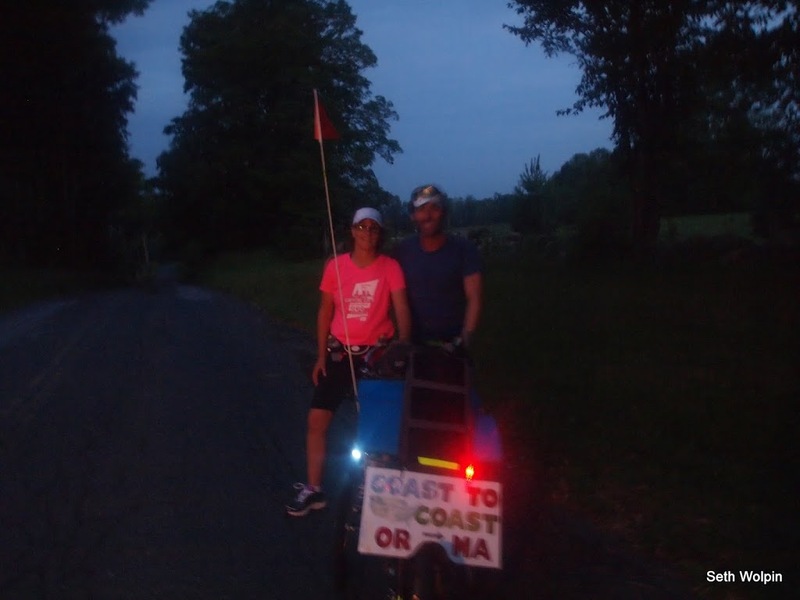 We cruised along and talked about the run and also about the triathlons he does and family before being joined at mile 12 by Elin and Chris, two of Jennifer’s running friends. The four of us tooled along, it was the biggest group I have run with so far on this trip and it was a lot of fun. 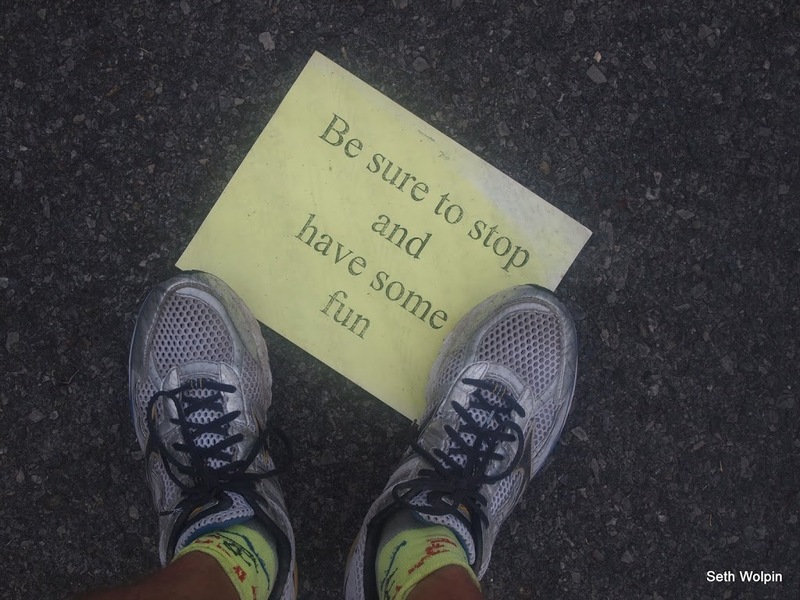 Chris was training for his first marathon in September (good luck!) and Elin was out to see if she could run 30 miles with me, having an eye on some 50 miler events. Yes, running is addictive. After a while it was just Elin and myself and the heat. 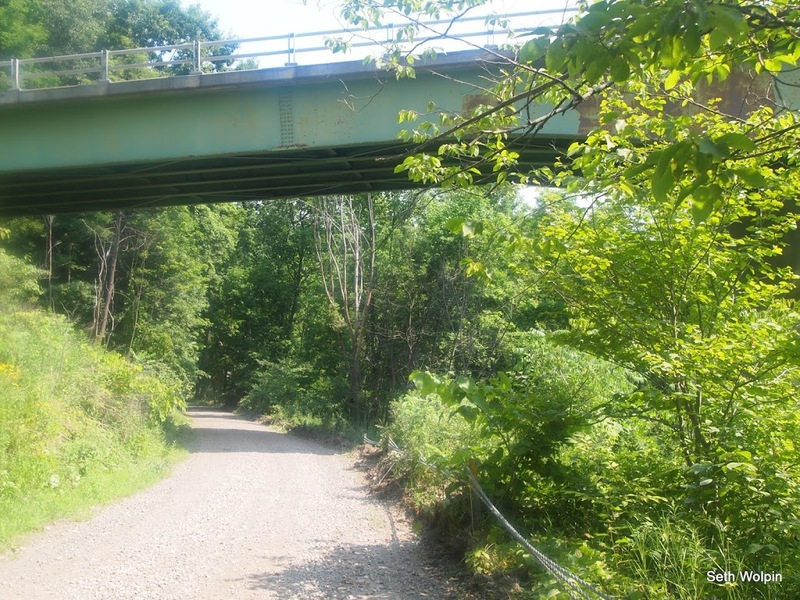 We cruised along and ended up running straight down into Albany and up the other side toward Jennifer and Diane’s house in Averill Park. I bought a big bag of ice to munch on along the way. 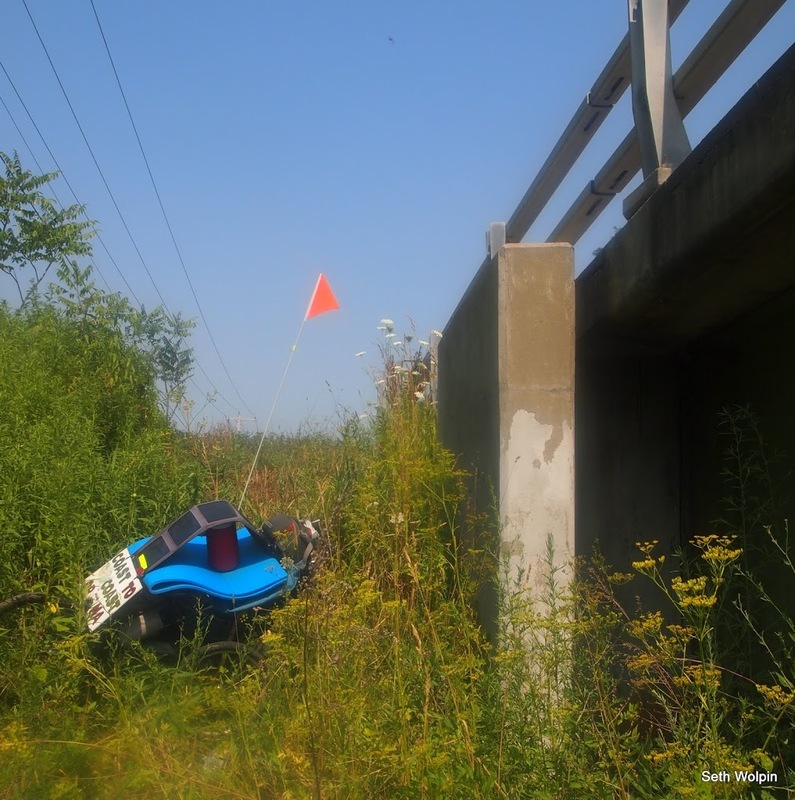 While trying to find the on-ramp to get the the pedestrian lane across the Hudson, another friend from northern NY – Nicole Cunninham caught up with us; we sat in her SUV and soaked in the AC while trying not to soak her seats. Cold beverages and chocolate followed (thanks!) and 15 minutes later Elin and I were running again and 25 minutes later we were above the Hudson. Elin did great and we were lucky to avoid the thunderstorms and also the direct sun thanks to ugly cloud cover. We raced the last 1/4 mile to Jennifer and Diane’s driveway. I’m going to call it a tie and would like to point out that I was pushing ~80lbs of stuff and had 12 miles on my feet. Lot’s of fun and we sat on the back deck until it started to rain. Jennifer and Diane came home a couple hours later; Jennifer PR’d at her triathlon but had also been caught out in the open on her bike in thunder and lightning. And with her socks soaked, she ended up with a feet full of blisters. 7/16: But blisters are no excuse and the next day Jennifer and another one of her running friends Vince joined me at 5am. Jennifer doubled back after 4 miles or so but Vince was keen on running 20. He had done 20 the day before and wanted to try a ‘back to back’ 20 and also see me into Massachusetts which was 15 miles from Averill Park. Thanks Vince! 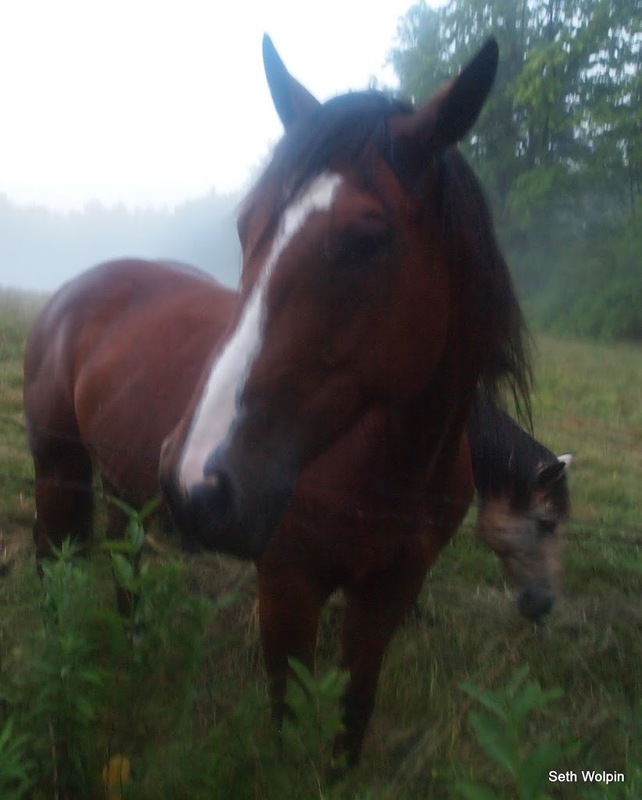 He also literally had my back thanks to the deer flies. Jennifer demonstrates ‘the jump’ again, this time with blisters. Notice the height difference from her pre-triathlon demonstration. growing out of his left shoulder. Getting to the Massachusetts border had me pumped but also caused me to be distracted. That, and the lack of a mileage scale on my phone mapping software (hello Google, how dumb is that?) caused us to miss a turn and we ran a few miles up the wrong road. Fortunately Jennifer and Diane were out looking for us to give Vince a ride home and their telephone call made me realize we were off track. It was hard to be mad about the extra mileage when Jennifer and Diane showed up with a cooler and snacks. After saying some farewells, I followed the third arm of a triangle to rejoin the correct route – the roads turned into super steep dirt roads and the heat became more intense. 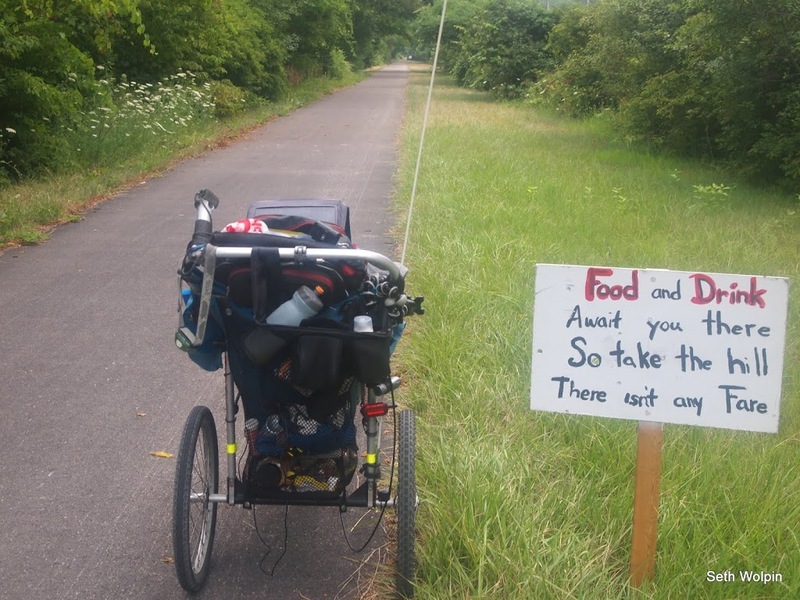 I called it quits 7 miles short of my goal, but the stopping point was poignant. It was where the Appalachian Trail crossed my trail, a spot I had walked across ~19 years ago while heading for Maine. There was also a little ice cream stand and I got to hang out with TP, a thru-hiker heading south from Maine, and also Kelly who was section hiking the trail and out to ‘do Massachusetts’. Best of luck! We talked until Jennifer and Diane picked me up to ferry me back to their house in Averill Park where I got to eat more good food and enjoy their great house and pets. 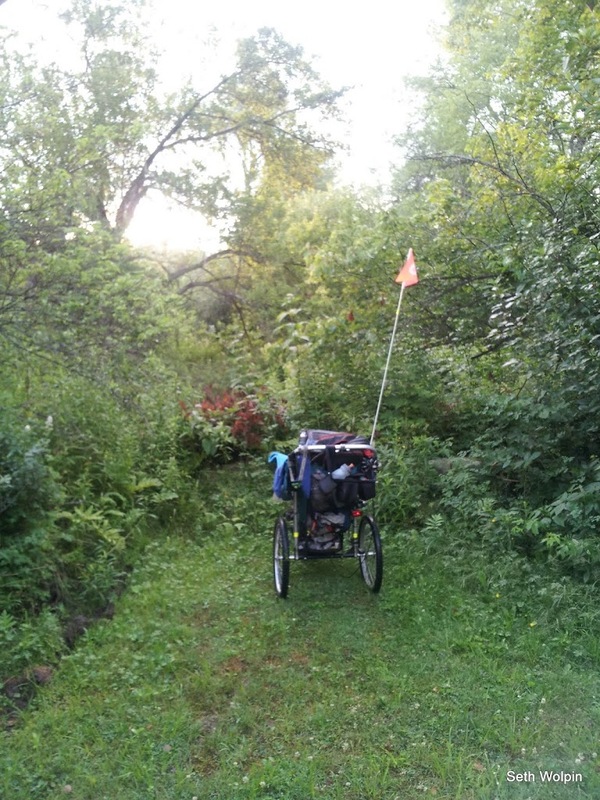 7/16th (yesterday) We headed out around 4am and unpacked back in the spot where the AT crossed my route in Cheshire, MA. 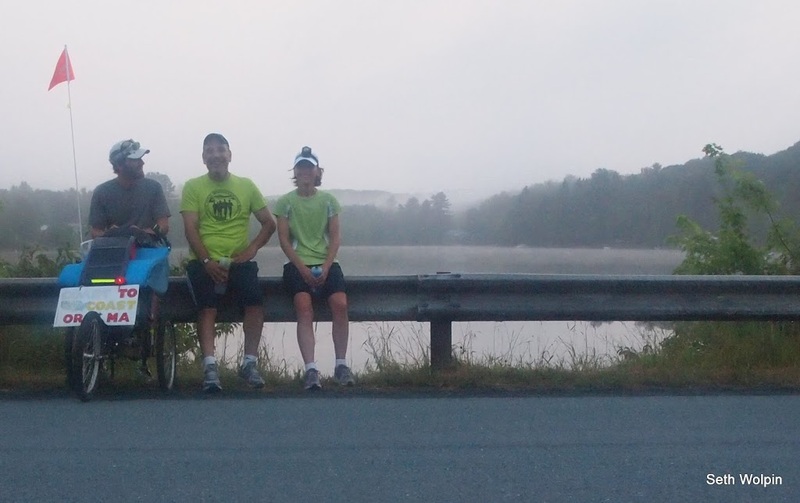 This time Diane ran with me – Jennifer’s blisters and muscles were in the two day post-tri stage, often worse than the one day post stage, and she dozed in the car with plans to pick up Diane after 5 miles or so. Diane and I ran over the hills and through the woods and past a sleeping Llama. We watched the sky lighten before Jennifer came by and scooped her up. A little while later, I hit two big obstacles thanks to using the google ‘walk’ option. In the first case the turn really didn’t exist because the road had been abandoned for 20 years. I found this out later from a local. Google does not know everything. Thinking I had overshot the turn, I ran back 1.5 miles and carefully studied a weird 100 foot path along someone’s property line. It ended in a wall of trees but matched the location of ‘Jackson Road’ on my GPS perfectly. 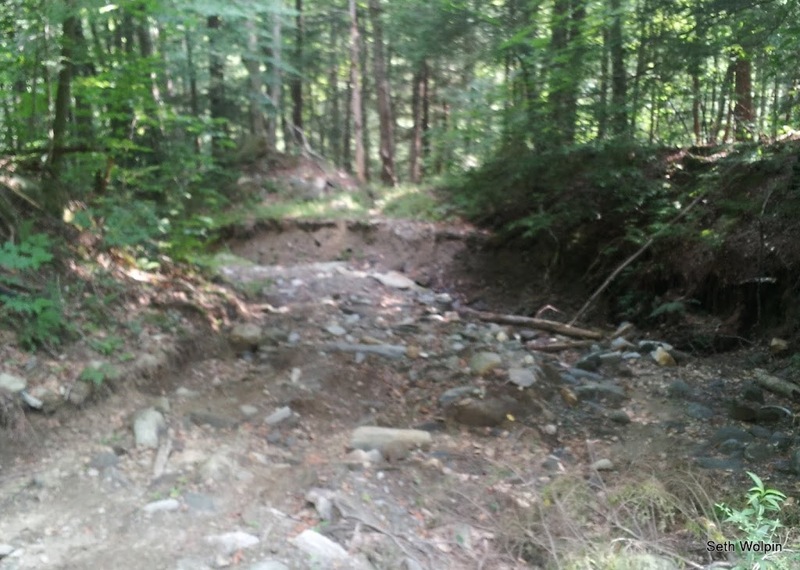 I guess I am fortunate I didn’t need to add 50 miles to get around this obstacle but my new route added about 5 miles to an already hot day. And later in the day I ended up on some of the most technical ‘roads’ I have been on. At one point I had to drag the jogger backwards to cover a mile – this took about an hour. The roads had ATV tracks on them and small downed trees. Some parts were washed away completely. Things bounced around so bad my cell phone flew out of the top travel bag on the jogger. The only way I realized this was because my stereo blue tooth headphones, which have a range of 30 feet, said ‘Blue tooth disconnected’ in my ears. I found the phone unharmed in the mud about 30 feet back. Losing the phone would have been disastrous. I stumbled into the small town of Charlemont three hours later than I hoped, mildly shell shocked and with the day really heating up and only 22m on my odometer. Doing 18 more seemed impossible with the coming heat (95 was projected along with significant humidity). 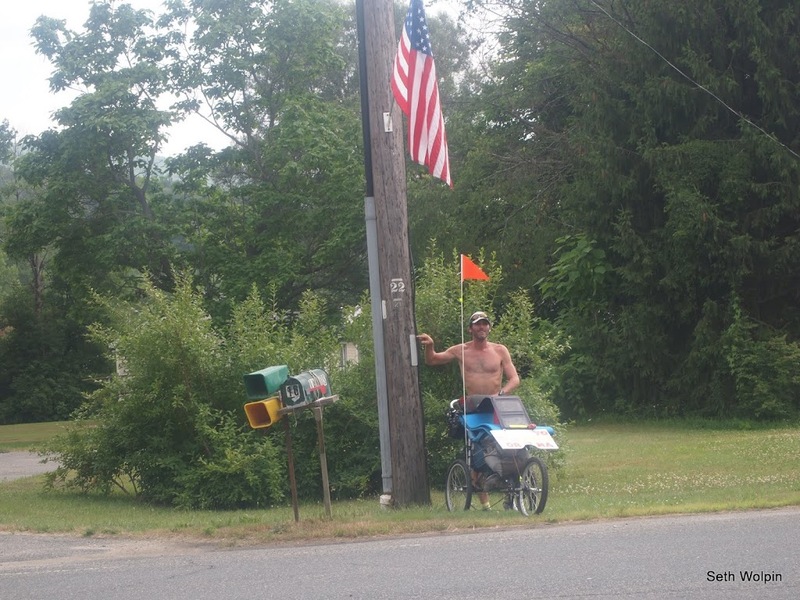 Glenn Caffery had been patiently waiting for me after taking an early morning bus from Greenfield. Glenn ran across last year raising money for Alzheimer’s research, managing an insane pace of 50 miles or more on most days. 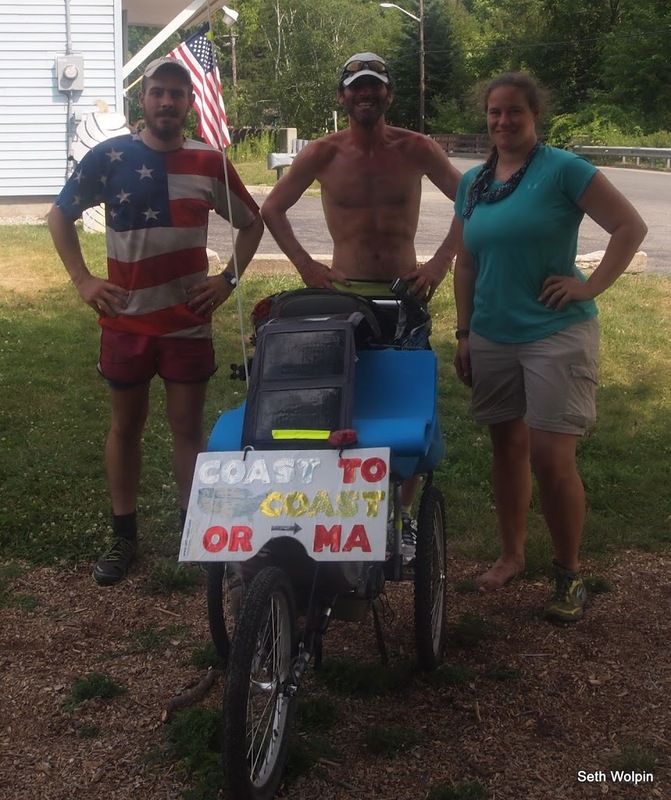 With a route starting in Seaside and finishing in Westerly, Rhode Island, we’ve run a lot of the same roads and he has been a great source of advice and support. Today was pretty uneventful. Just hot. Glenn dropped me off at the supermarket around 6am and I made my way west for 30 miles. Not a lot to remark on and this post is far too long anyway at this point. I’m too beat now to do the fundraising hard sell but I have appreciated seeing the email notifications come into my in-box. Hopefully tomorrow. Good night! As a reminder, I’m doing this for two causes and trying to raise $2,000 for each. I’ve raised $1,845 for Dana Farber and $1000 for the Sherpa School Fund. Thanks to all of those who have donated and to those that will. I know not everyone can, feel free to simply follow along.